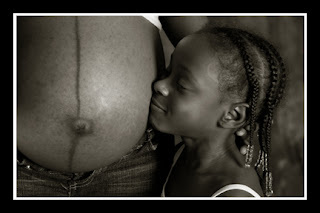 NIKKI NICOLE PHOTOGRAPHY: Pregnant Bellies! So in the past 2 months I have had the pleasure of photographing 2 women and their bellies! One of them is my bride from this past fall. It was great to have Angela (the fall bride) come back and let me photograph her and her belly. We did some really nice artsy, more artistic photographs and then some fun ones as well. I love when my past clients come back to me. I feel more of a connection and I am really looking forward to meeting this little one on the way. As for my other client I had such a blast with her and her 2 daughters. She had found out that this child was to be a boy! How exciting for her since she already has 2 girls. I really enjoyed our session. It was nice to have her children part of the session and interact with the belly. This photograph below was one of my favorites.